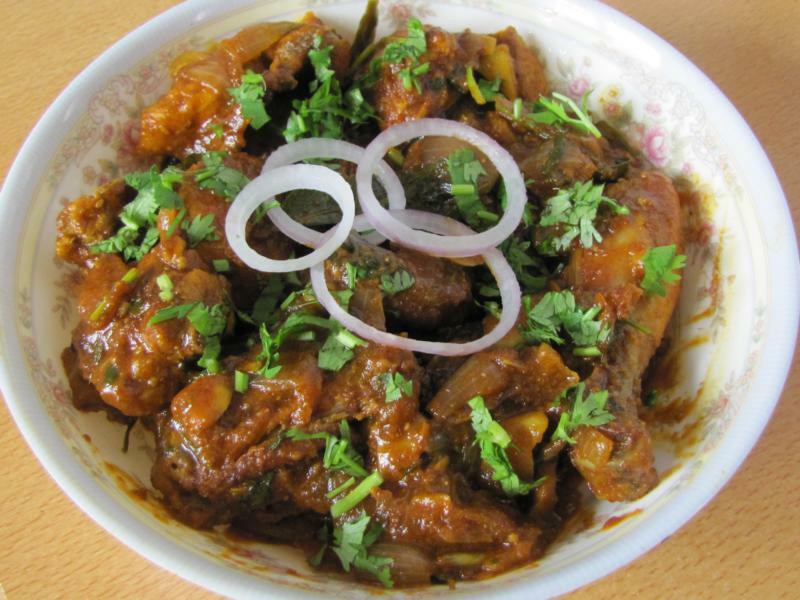 There is no dearth of chicken recipes out there….the web world is swarming with so many poultry recipes that you can almost hear the clucking of numerous chickens!! And how can it not be, since it is one of the easiest, most delicious, accessible and affordable meats on the market. Not to mention the versatility of chicken, and the fact that you can hardly go wrong with it (unless you have never entered a kitchen before). It is exactly this versatility of chicken that encourages me to try something different every time. Rarely do I follow the exact same recipe. There are almost always minor or major tweaks to tried and tested recipes, or sometimes my hands lead the way and cook up something completely new. This is one such recipe that came out of one of the experimentation sessions. 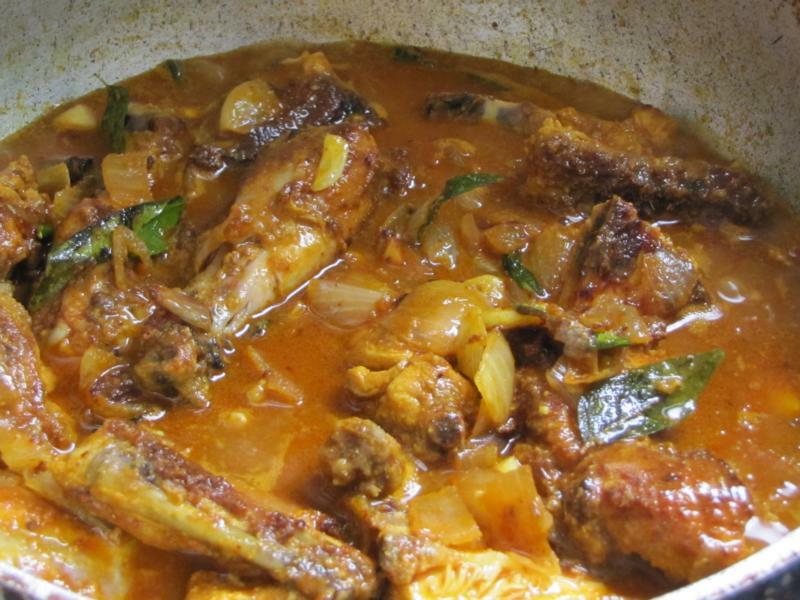 The marinated chicken is shallow fried first and then simmered in spicy sauce. As it is fried, I don’t make it very often, but when I do make it, it is guaranteed to vanish pretty soon! So here is another contribution to the web world clucking! 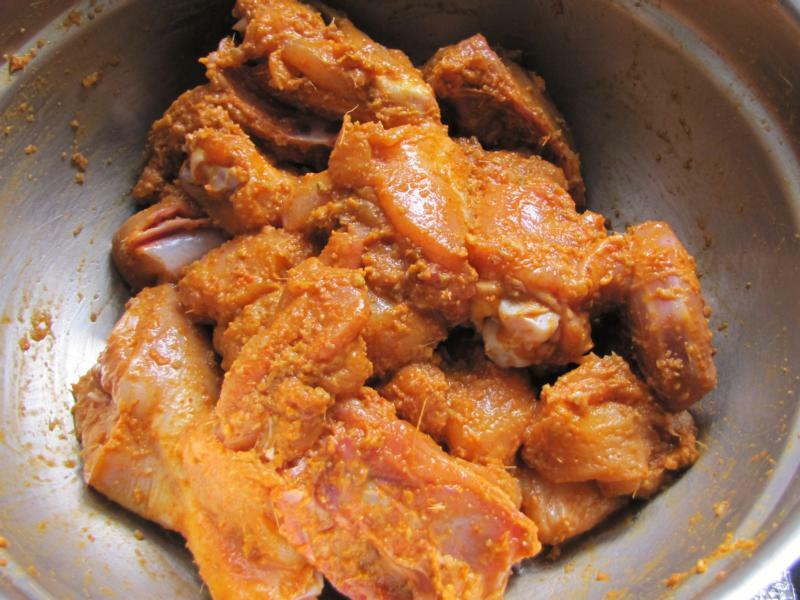 I marinate the chicken with a paste of ginger, powdered fennel seeds, chili & turmeric powders, lime juice and salt. Let it sit for atleast 2 hours and then shallow fry it on medium heat till brown on all sides. At this point, normally, the fried chicken starts to disappear in my kitchen with my husband smuggling out pieces. If you plan to serve this chicken as a starter, you can stop right here (probably fry the chicken for a bit longer). Or you can continue to spice it up a bit more. 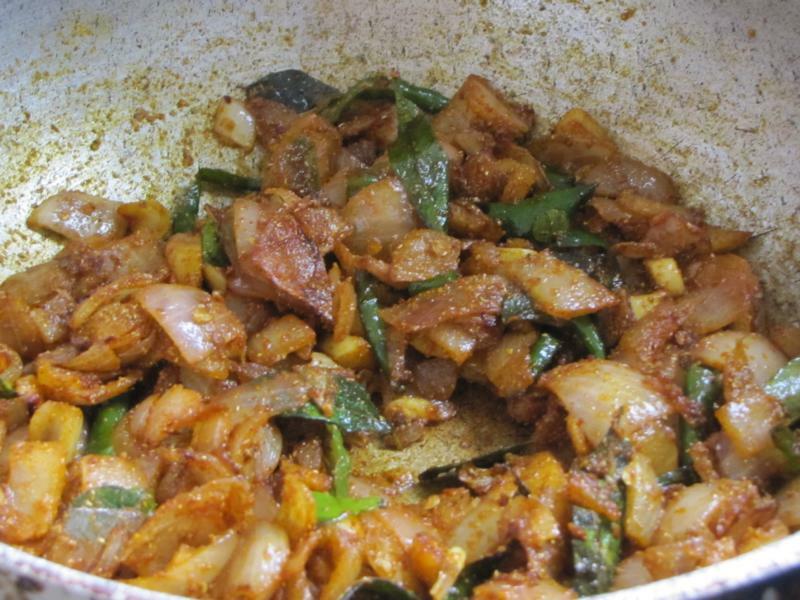 So start making the thick spicy sauce by stir frying onion, garlic, green chilies and curry leaves. Then add the spice powders – turmeric, chili, coriander and garam masala. Normally in our family, we like this dish very spicy. You can adjust the spice level to your preference. I use Tomato ketchup in this recipe instead of raw tomatoes. It gives a hint of sweet, tangy taste in this rather spicy dish. 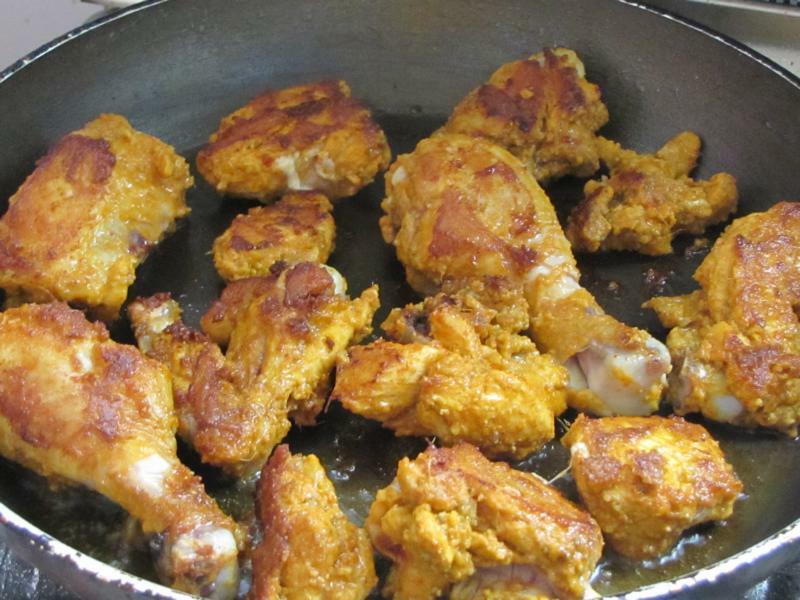 Add the fried chicken and very little water. Sprinkle the fresh coriander leaves and bring it to a boil. Cook on high flame for a couple of minutes till semi-dry. Be sure to stir to avoid burning. Serve as side dish with rotis, parathas or fried rice. 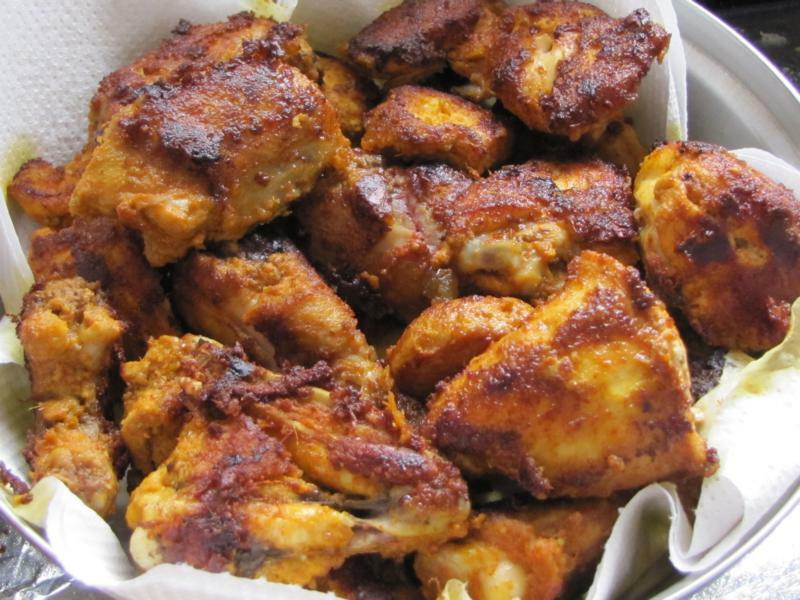 Grind the ingredients listed under marinade and marinate the chicken. Let it sit for atleast 2 hours. 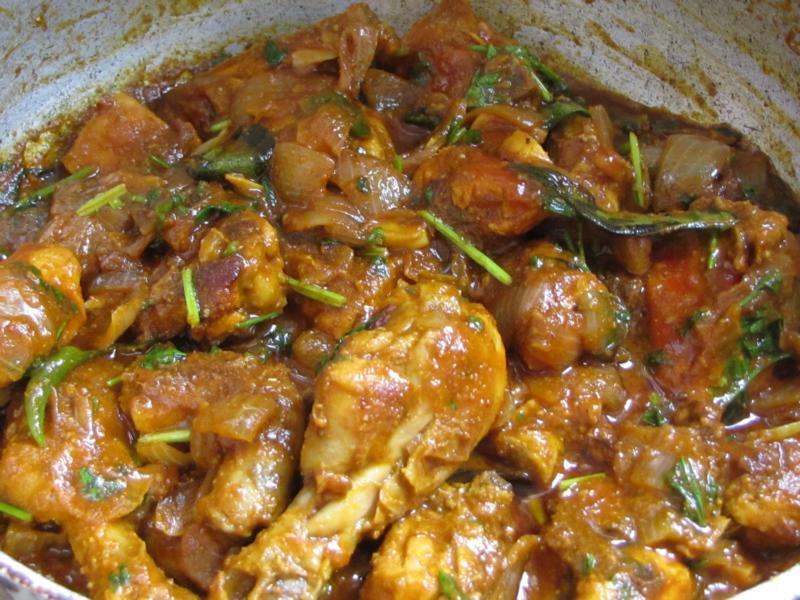 In a non stick pan, heat the oil and fry the marinated chicken on medium heat in batches till it turns brown on both sides and is cooked. Keep aside. 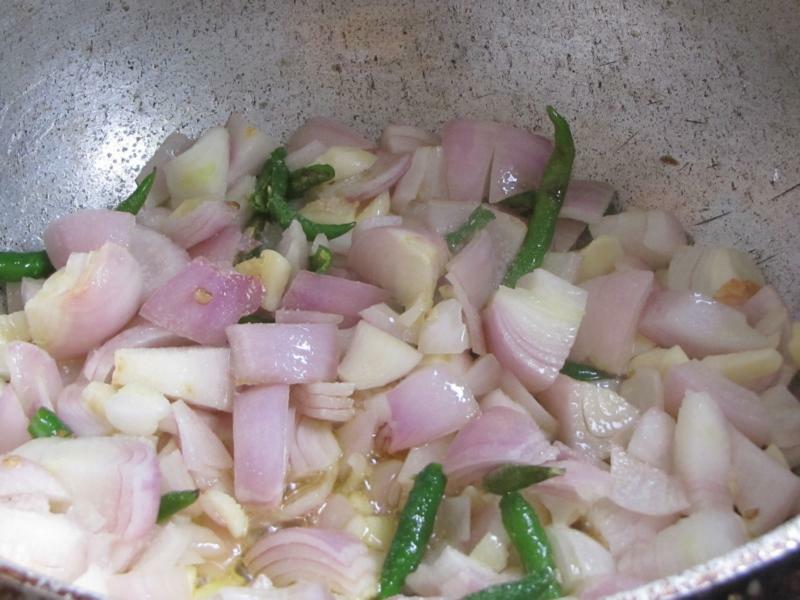 Heat oil in a pan, add the onions, green chilies, garlic, curry leaves and let it fry for around 5 minutes till it just begins to turn brown. Add the dry spice powders, ketchup, salt and fry for around 3 minutes. Garnish the chicken with onion rings and coriander leaves. That chicken masala looks delicious!! I have bookmarked it. Thanks for sharing! wish you a pleasant day!!! looks attractive hope to taste some time. Thanks for stopping by.Hope you tried the recipe. Wish you a good day! !